Since eyes are the windows to your soul, it’s only appropriate to spend more time on finding the perfect frames! Though often overlooked, eyebrows are the focal points of our face. The right brows can enhance our facial features, lift, and even slim our faces. 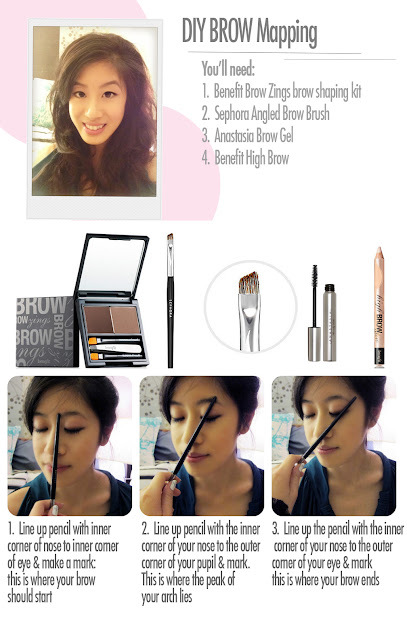 I met up with my friend Monica for some tips on how to get the perfect brows! Here’s a post on how to shape, fill in, and elongate your brows. Using Sephora’s Angled Brush, connect the three pre mapped points with short feathery strokes. Apply in the direction of hair growth. Avoid drawing one solid line, instead, simply fill in sparse areas.